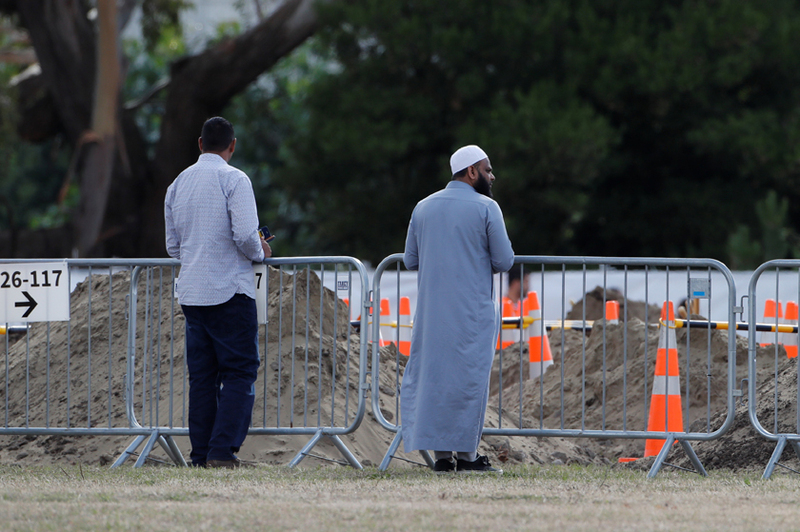 CHRISTCHURCH, New Zealand: Relatives of those killed in last week’s shootings at two mosques in New Zealand began to bury the dead Wednesday, as the country’s prime minister renewed her call to remember the 50 victims rather than the white supremacist accused of slaughtering them. Hundreds of people were gathered at a grave designated for Muslim burials as the first two funerals got under way. Their identities were not released in advance. While many of the victims will be buried there, some are being brought back to their home countries, officials have said. Families of those killed had been anxiously awaiting word on when they could bury their loved ones. New Zealand Police Commissioner Mike Bush said police have now formally identified and released the remains of 21 of those killed. Islamic tradition calls for bodies to be cleansed and buried as soon as possible. New Zealand’s Prime Minister Jacinda Ardern’s plea not to give any notoriety to the accused 28-years-old Australian white supremacist first came in a speech to Parliament prompted by the accused gunman’s decision to dismiss his lawyer and represent himself. The move had raised concerns he would use the trial as a platform for his racist views. During a visit to a high school that lost two students in the shootings, Ardern revisited that thought and asked students not to say the attacker’s name or dwell on him. The Cashmere High students killed were 14-year-old Sayyad Milne and 16-year-old Hamza Mustafa. A third Cashmere student, Mustafa’s 13-year-old brother Zaed, is recovering from gunshot wounds to his leg. “He is a terrorist. He is a criminal. He is an extremist. But he will, when I speak, be nameless,” Ardern said in her address to Parliament on Tuesday. Ardern told reporters she would do everything possible to ensure that the gunman was denied any chance to lift his profile. But she demurred when asked whether she wanted the trial to occur behind closed doors, saying that was not her decision to make. The shooter’s desire for attention was made clear in a manifesto sent to Ardern’s office and others minutes before Friday’s massacre and by his livestreamed footage of his attack on the Al Noor mosque. Arden said she had received “some communication” from Facebook’s Chief Operating Officer Sheryl Sandberg on the issue. The prime minister has also spoken with British Prime Minister Theresa May about the importance of a global effort to clamp down on the distribution of such material. A judge ordered Tarrant to return to New Zealand’s High Court on April 5 for his next hearing on one count of murder, though he is expected to face additional charges. The 28-year-old Australian is being held in isolation in a Christchurch jail. Peters did not return a call from The Associated Press. Peters told the paper that Tarrant didn’t tell him why he wanted to represent himself. He said a judge could order a lawyer to assist Tarrant at a trial, but that Tarrant would likely be unsuccessful in trying to use it as a platform to put forward any extremist views. Ardern previously has said her Cabinet had agreed in principle to tighten gun restrictions in New Zealand and those reforms would be announced next week. She also had announced an inquiry into the intelligence and security services’ failures to detect the risk from the attacker or his plans. There have been concerns intelligence agencies were overly focused on the Muslim community in detecting and preventing security risks. New Zealand’s international spy agency, the Government Communications Security Bureau, confirmed it had not received any relevant information or intelligence before the shootings. Ardern also used her address to highlight the bravery of Naeem Rashid, originally from Pakistan, who died after rushing at the gunman and trying to disarm him. And she cited the heroism of Abdul Aziz, who ran toward the attacker screaming and threw a hand-held credit card machine at him, hoping to distract him. Aziz’s actions are believed to have saved many lives at the Linwood mosque, where seven of the 50 victims were killed. As of Tuesday evening, 30 people were still being treated at the hospital, nine of them in critical condition, medical officials said. A 4-year-old girl was transferred to a hospital in Auckland and is in critical condition. Her father is at the same hospital in stable condition. 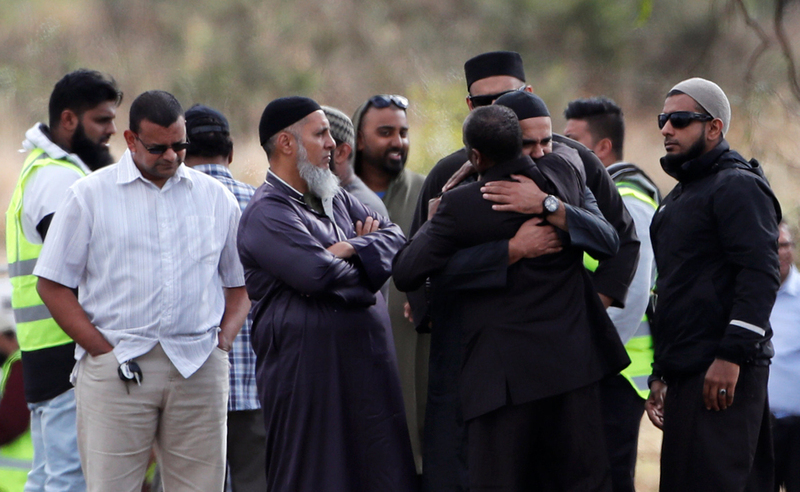 Sheik Taj El-Din Hilaly, of Sydney, traveled to Christchurch to attend or lead some of the funerals. Through a translator, he said he felt compelled to support the grieving. A nationwide lockdown on mosques was imposed until Monday, which Hilaly said had upset Muslims whom he had visited in Auckland. Police continue to guard mosques across the country. Residents of this close-knit city have created makeshift memorials near the two targeted mosques and at the botanical gardens, where a mountain of flowers has grown by the day. Janna Ezat, whose son, Hussein Al-Umari, was killed in the Al Noor mosque, visited the memorial at the gardens and became overwhelmed by the outpouring of love. She knelt amid the flowers and wept, grabbing at daisies and lilies as though she might find her boy in them.